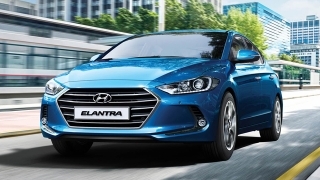 Hyundai's sporty hatchback as a daily car? Yes. Velocity. Velociraptor. Speedster. 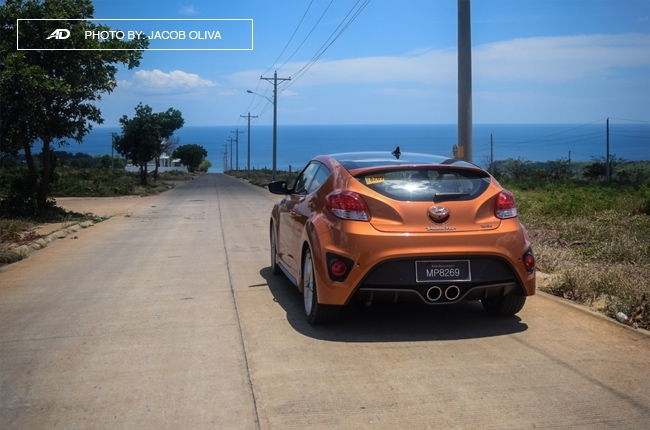 Whatever it is that you want to associate with the Veloster nameplate, it will always be fierce, fast, and with character. 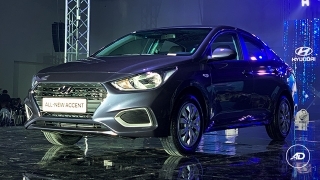 The name’s fitting, as Hyundai’s sporty hatchback has a head-turning design and performance figures that are enough for it to stand out among the South Korean marque’s non-SUV lineup. That’s why when Hyundai Asia Resources, Inc. (HARI) brought it in the Philippines last year, it tapped our interest and desire to get inside its cockpit; moreso, when the more powerful turbo variant was the one imported here. 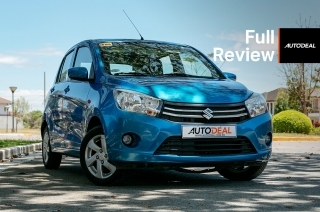 It also brought us to the question: can this fast and fancy hatchback fit as a daily car? 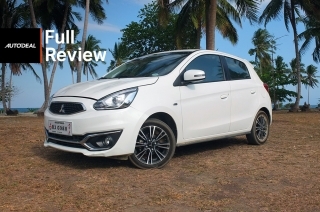 HARI seem to have read our minds and lent us the keys to its sole Turbo GLS Premium variant. Good times. Solid engine performance in Sport mode. Hill-Start Assist could be better. 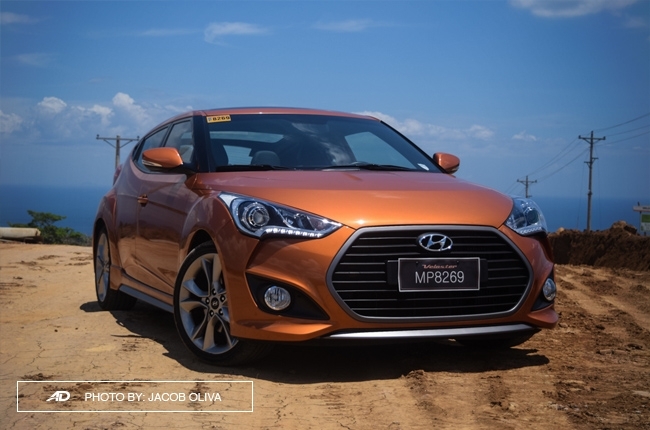 If it isn’t obvious, Hyundai based the Veloster Turbo on the Accent Hatchback’s platform. 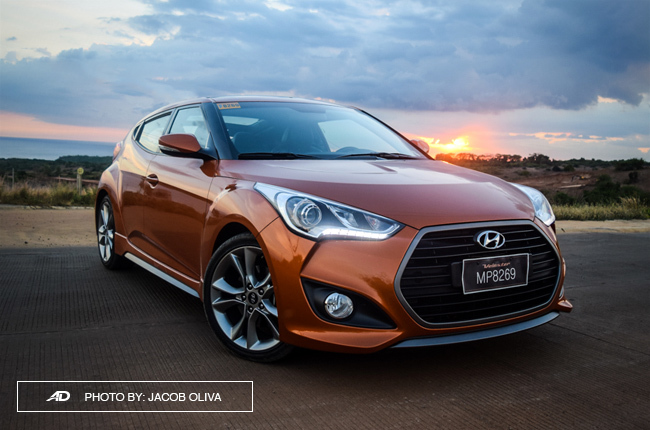 The resemblance is undeniable; however, the Veloster has a more imposing style. Its robust fender flares give it a wide stance, while the muscular hood, chiseled front and rear bumpers (with diffusers), silver skirts, and sharp character lines exhumes an athletic aura. Basically, the Veloster is like an Accent Hatchback that buffed up in the gym and binged on steroids. 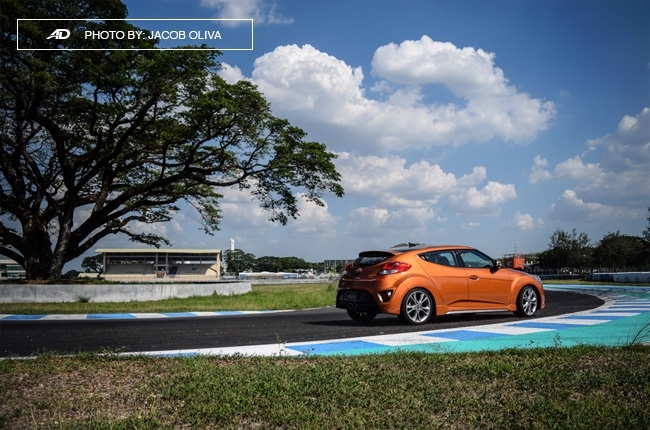 Yes, they share the same platform but the Veloster’s body is substantially bigger – 135mm longer, 105mm wider, and has an 80mm longer wheelbase. Although, the Accent Hatchback is taller by 52mm – that says a lot about the Veloster’s headroom, which we’ll talk about later. 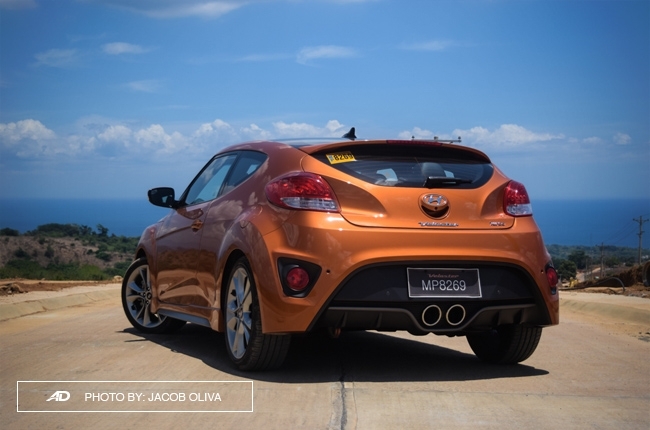 The Veloster Turbo's look isn't a head-turner without a few quirks. 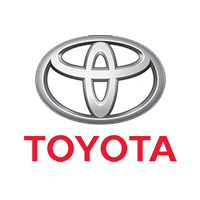 For instance, it has an asymmetric door design, with 1 long door for the driver and 2 shorter ones for the front and rear passengers. 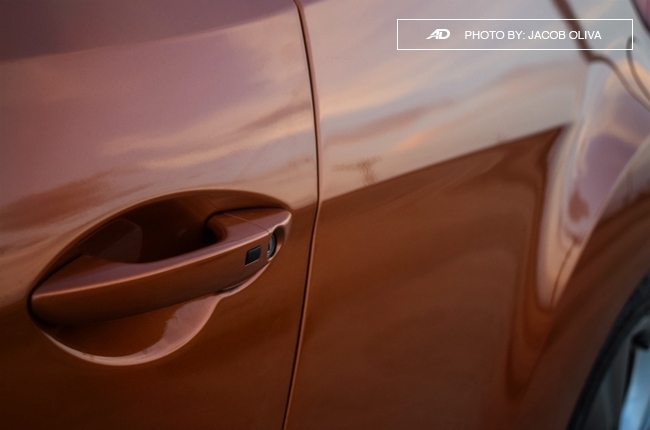 The door handle at the back is hidden by the C-pillar, which gives it a 2-door coupe illusion. These traits might look (and sound) weird for some, especially with its relatively long body. Personally, I dig it, as the oddities add to the appeal of this sporty hatchback. The sloping black glass roof looks perfect, along with its rear spoiler, shark fin antenna, and 18-inch alloy rims. That's without mentioning the huge central twin exhaust pipes at the back; those are this car’s crown. One look at the car and you know it’s meant to be driven fast. 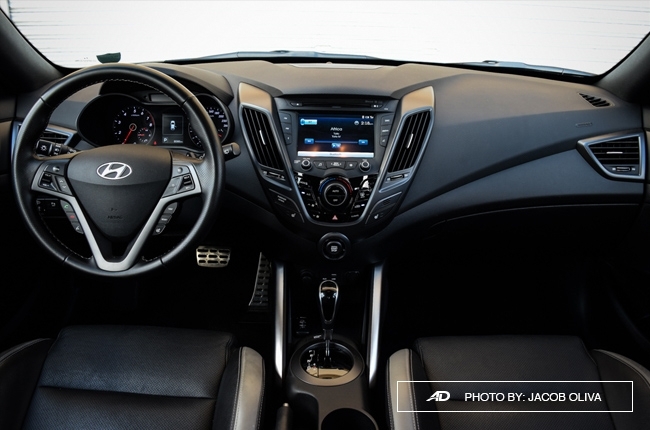 Inside the Veloster Turbo is just as sporty as its exterior. First thing you'll notice is its leather front bucket seats with screaming “Turbo” stitched on it. 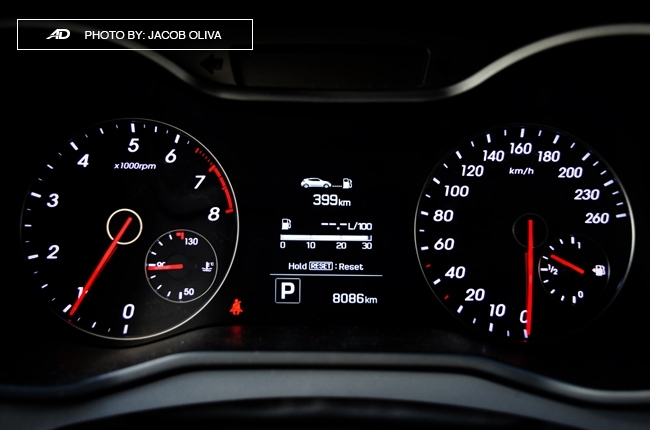 The dashboard layout is also filled with angular deviations – a more aggressive and bolder approach than the conservative Accent Hatchback. Although, the air conditioning vents at the center could look better if it's not vertical. Still, the quality of the materials used, such as the carbon-fiber printed plastics and leather accents, are enough to justify its P1,608,000 price tag. 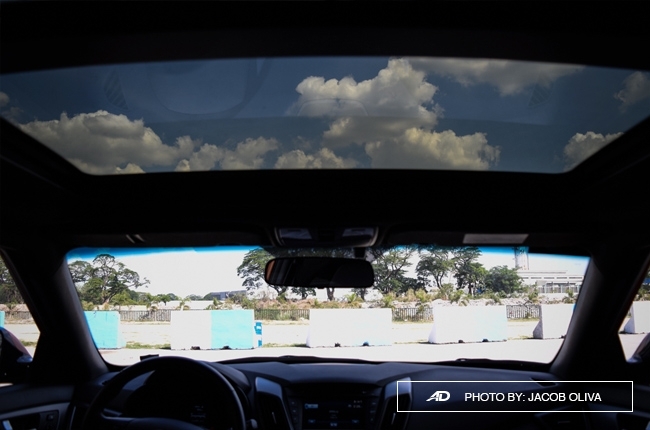 Add the panoramic moonroof to that and you've got yourself a wow-worthy car. 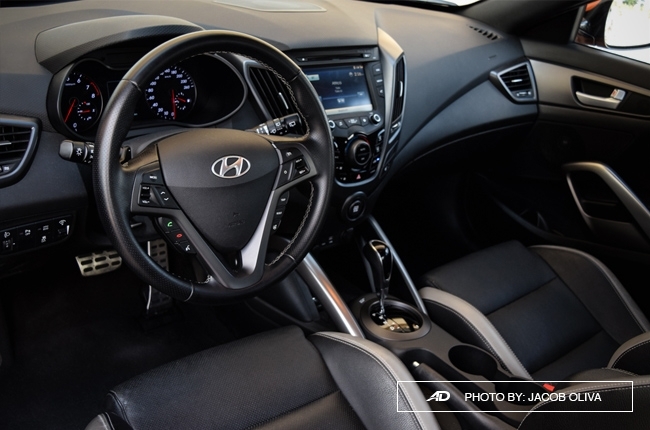 Aesthetics aside, the ergonomics and functionality of the Veloster's interior amenities are noteworthy. The buttons at the center console are well-placed for the driver's convenience, while the audio, call, and cruise controls on the steering wheel aren't so crowded. 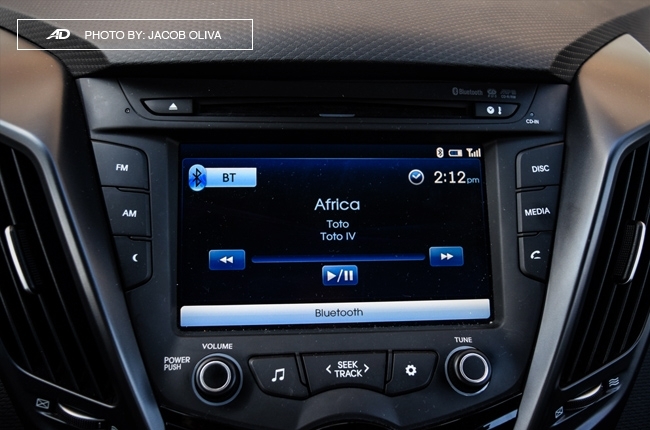 The 7-inch LCD head unit is also easy to use and pair up with your smartphone via Bluetooth and USB input; it will even autoplay your recently played music once connected. 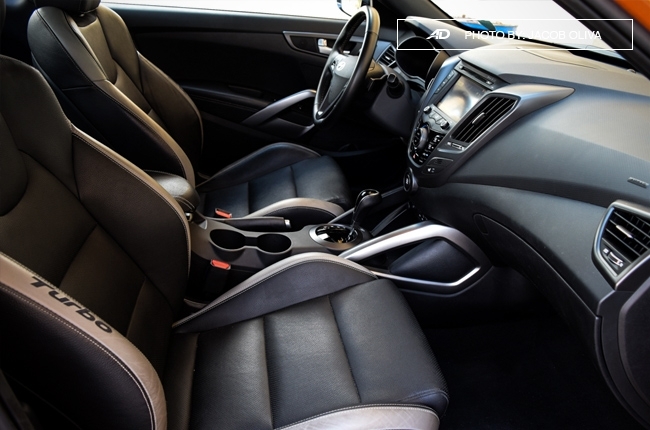 Hyundai is generous with the Veloster’s leg- and elbow-room, even at the back. 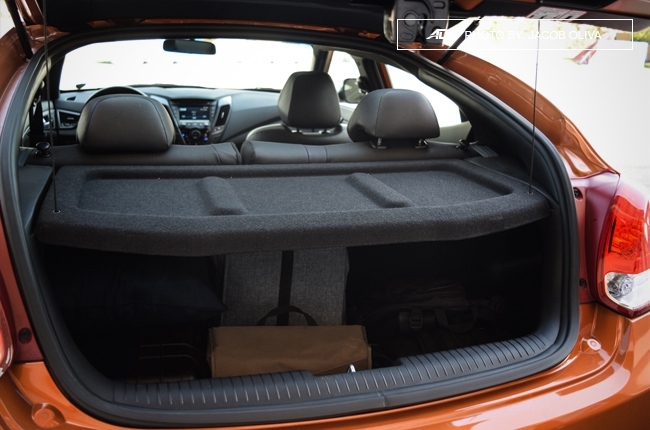 Trunk space is also deep, which can fit 1 huge toolbox and 3 full-size backpacks, with margin for more. You can further maximize that by folding the rear seats in 60:40 fashion. We wish we could say the same for its headroom, as people taller than 5'10" will have less space between the ceiling. (I guess that's the price you must pay if you want a good-looking car). 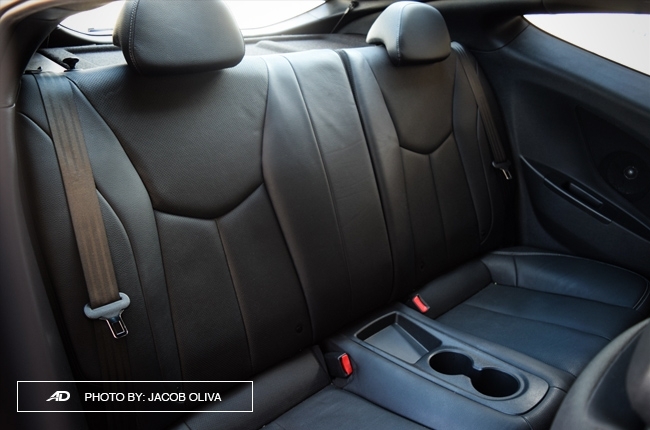 It can only seat 4, though; the rear seats can accommodate 2 people, with the middle part reserved for cup holders. 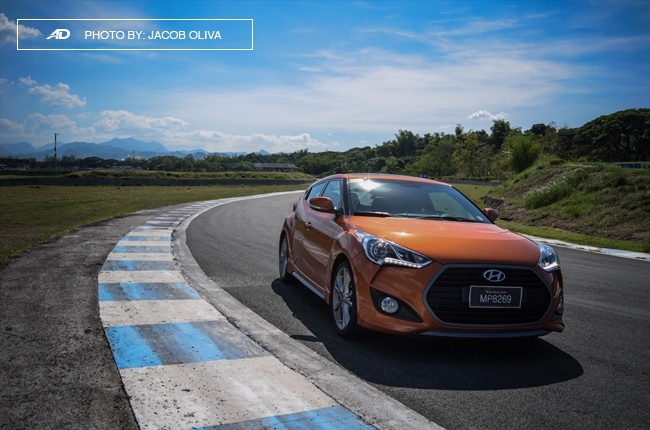 The Veloster has a relatively soft suspension that can absorb road imperfections. 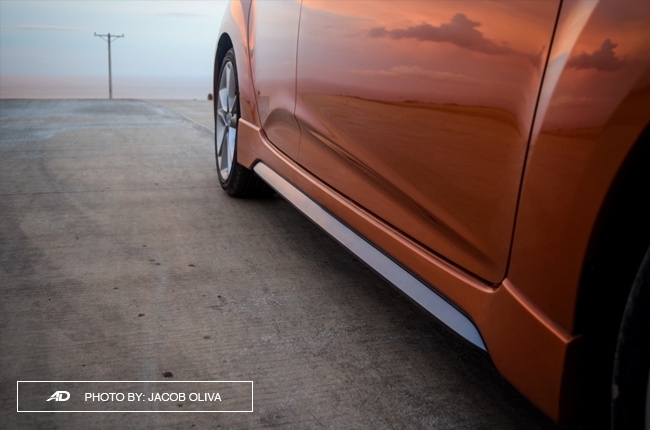 Body roll is present but minimal even on tight corners, making its ride comfort favorable to the occupants. 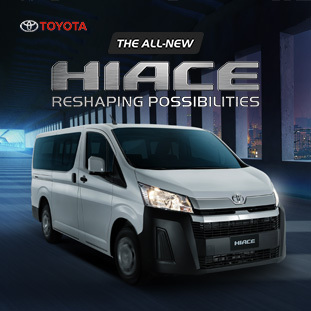 Its NVH insulation and automatic air conditioning are quite good as well, which add to the overall coziness of the vehicle. 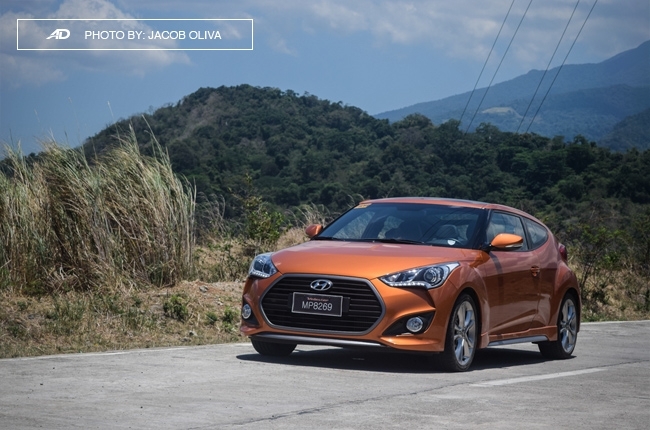 Although you sit low with the Veloster, it has almost the same ground clearance as the other non-SUV Hyundais, so humps aren’t much of a problem with it. 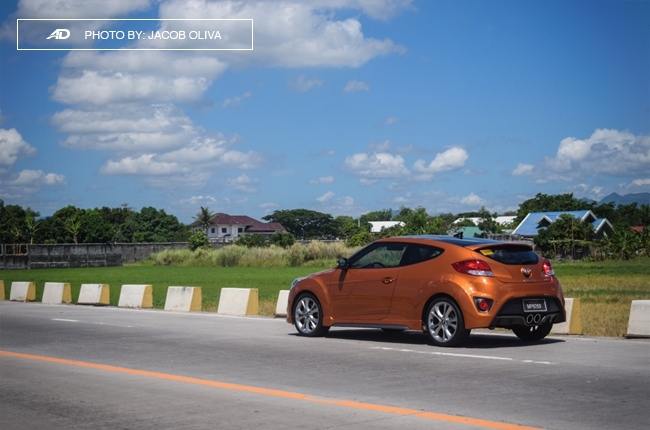 Aside from its looks, the Veloster Turbo’s performance figures are well above the compact car segment. 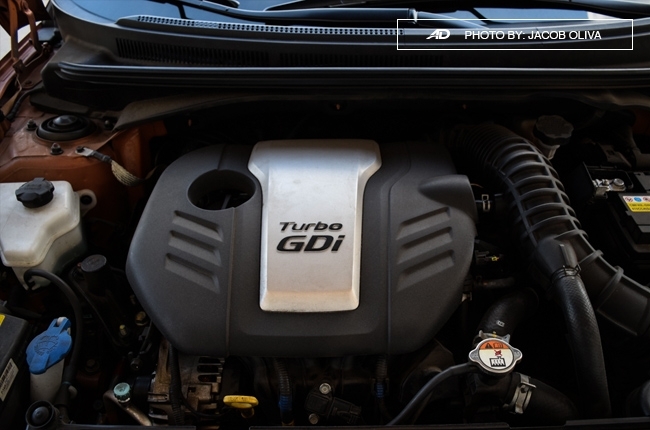 The 1.6L turbocharged-gasoline direct injection (T-GDi) engine can produce 204 hp and 265 Nm of torque. All that power is then transferred to the front-wheels via a 7-speed dual clutch transmission with paddle shifters. 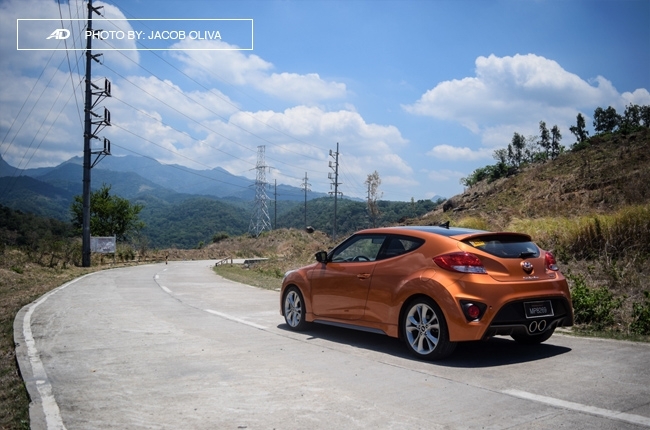 If you'd like to have fun and push the Veloster Turbo’s engine performance, you can easily do so in Sport mode. The engine responds quickly to every step on the pedal, while the RPM range is maximized at every gear to give you its full power. By the time the turbo kicks in, you’re in for a heart-pumping ride. Although, you might want to reserve using this mode for the racetrack or on the highway as fuel consumption is the wager for a fast drive. We got a 6.7 km/l fuel consumption reading while running at an average speed of 95 km/h on the expressway – numbers you don’t want to see daily. 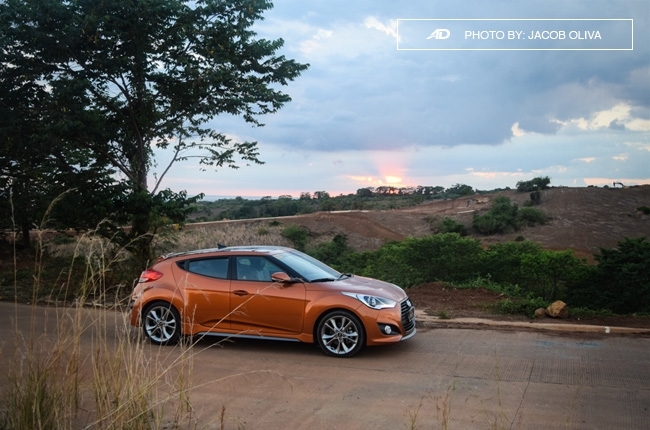 The good thing about the Veloster Turbo is that you have the option to drive it in a more relaxed manner. 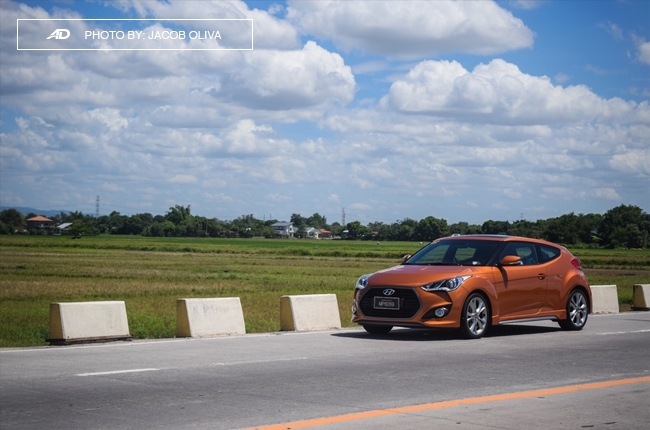 In its Eco mode—which will immediately get you out of lower gears (at around 2,000 rpm)—the fuel consumption improved to 8.5 km/l in the city at 20 km/h, while highway stints registered 14.5 km/l. Normal mode, on the other hand, gave a slight decrease in these numbers but still notable. It can get boring while in these modes, though. With only 2 people inside, we felt that the Veloster somehow lacks power; each step on the accelerator won't give you the expected pull. 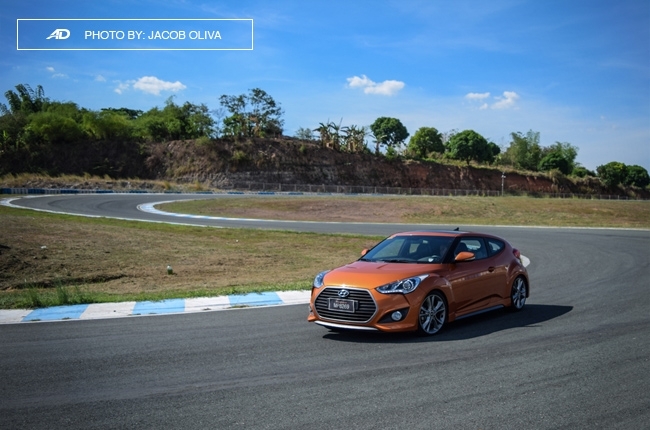 On inclines, we also noticed that even with its Hill-Start Assist on, it took time before the car launches forward – something that Hyundai needs to work on. 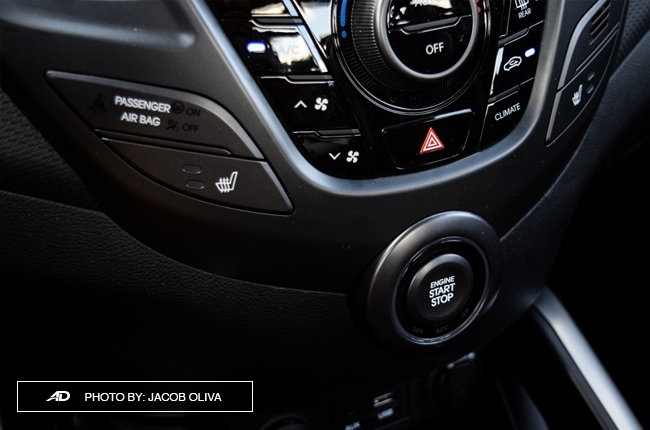 The Veloster Turbo has 3 steering modes that can be toggled through a button on the steering wheel. Comfort mode is too light for our liking, while normal mode gives you a more acceptable lightness, fit for tight city maneuvers. For Sport mode, it stays true to its name as it gives you a heavier feel of the wheel. 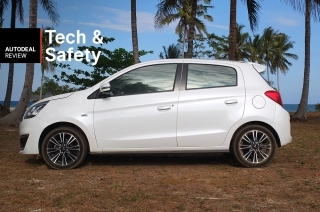 This gave us confidence during high speed drives on both the highway and on the race track. Driving visibility is also generous while at the driver's seat, however, there's a huge blind spot at the rear right side. 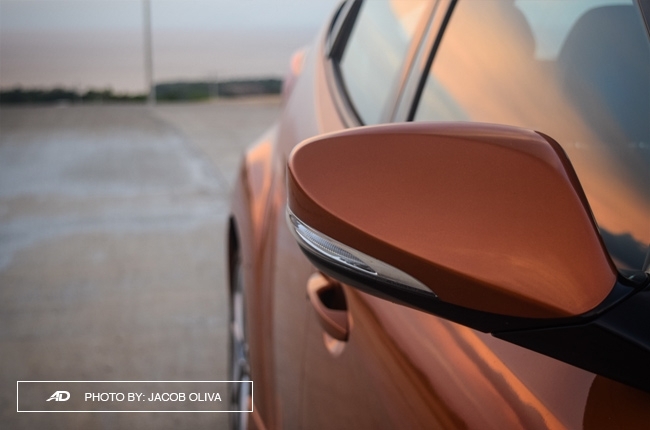 This is because of the narrow triangular rear window design, which adds sleek to the vehicle's overall styling but lessens your peripheral vision when you glance. Again, a price you have to pay for a good-looking car. 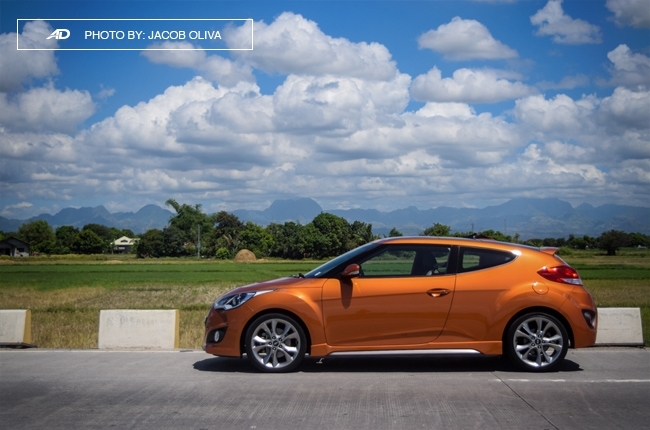 The Hyundai Veloster Turbo is priced at P1,608,000. With this amount, you get a fast, head-turner that looks good inside and out, and a personal city transporter that doesn’t guzzle too much on gas. It’s a perfect option for bachelors and bachelorettes who want a fancy car but don’t want to empty their pockets for fuel, or those who are busy in the city on weekdays but are itching to go out on race tracks during weekends. 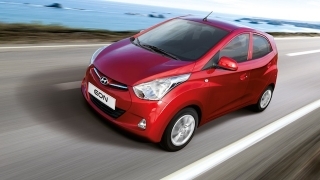 We just hope Hyundai keeps its positive traits and upgrade the imperfections in its 2nd generation model.